Following a juried selection process, nine artists have been invited to render their work in chalk on cement canvases located throughout downtown during the BID’s fifth annual Northampton Chalk Art Festival on Friday, September 12. This special “Arts Night Out” event features cash prizes of $250, $150, and $100 awarded by a panel of judges for the top three creations. Presentations are made on the steps of City Hall at 5 pm. Drawing takes place downtown from 10 am until 4 pm on the day of the event. The public is encouraged to watch the chalk art pieces develop and to view completed work in the evening while enjoying Northampton’s monthly gallery walk from 5-8 pm. The public is also invited to an informal “family free draw” in front of the Arts Trust building at 33 Hawley Street, 5-7 pm. Sidewalk chalk is available for anyone who wants to participate. “Chanterelle to Go” brings its fabulous food cart to the site, and music is provided by “Prone to Mischief,” a delightfully sophisticated brass band. Visitors are invited to tour the inside of the building and view the plans for its transformation into community arts space. Selected chalk artists for 2014 include former prize winners and veteran competitors Stephanie Gerolimatos, Mark Bodah and Matt Rodriguez who form Team Bodalimadriquez and “The Living Art Studio” partners Scot Padget and Jon Hanna. Mural and mosaic master Robert Markey makes his third contribution to the festival, and both Dean McKeever and Linda Babcock join the competition for second time. Chrissy Neithercott of Chesterfield and Sloan Tomlinson of Hatfield participate for the first time as do noted local artists Sally Curcio and Stephen St. Francis Decky. The designated chalk art sites, except for the Smith College Museum of Art on Elm Street, are all located on Main Street: the Academy of Music; ode; Pinch; the Artisan Gallery; Thornes Marketplace; First Churches; Don Muller Gallery; William Baczek Fine Arts. Along the route, viewers have an opportunity to stop in at venues that participate in Arts Night Out. A detailed listing of exhibitions appears on the Arts Night Out website at www.artsnightout.org and is published in the brochures found at participating locations where maps of the chalk art sites are also available. 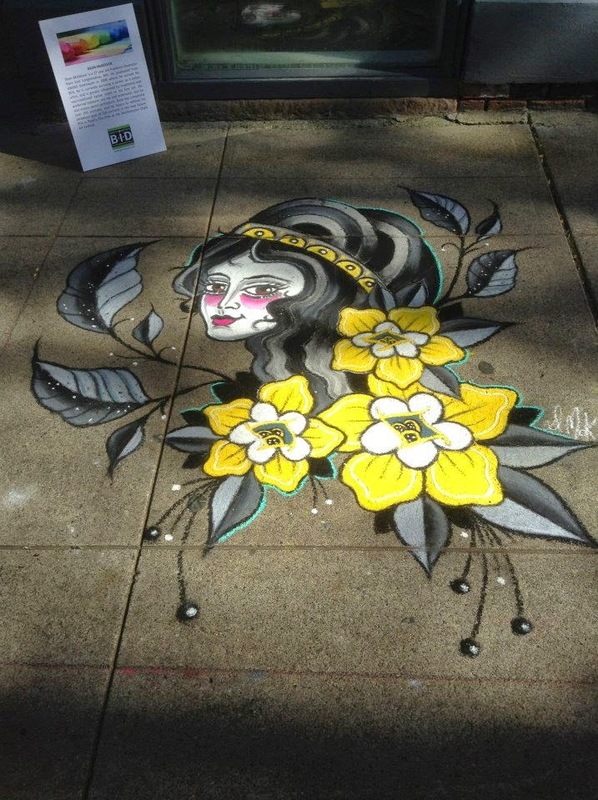 The Northampton Chalk Art Festival is a presentation of the Northampton Business Improvement District (BID) It sponsored by Chartpak, Inc. and produced in cooperation with the City of Northampton and the Northampton Center for the Arts.